Pinin Farina was responsible for what we’ll call the “base” Ferrari 250 GT Coupe. 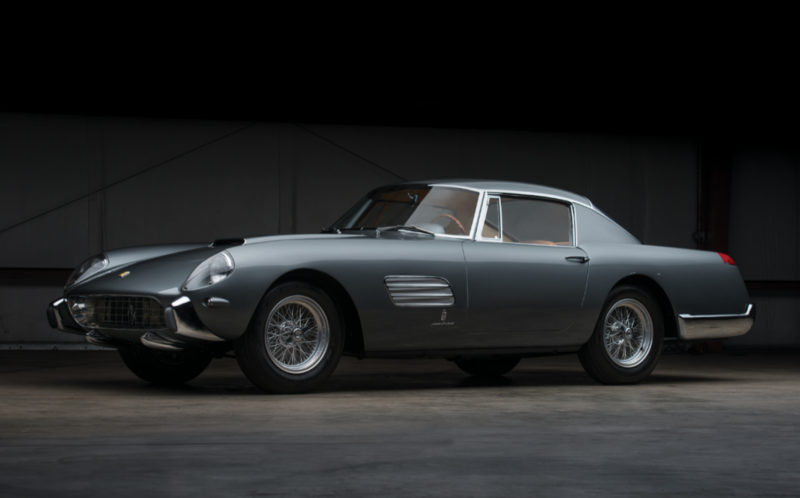 Produced from 1958 through 1961, these cars were the volume-leader model among so many special, limited-edition 250 GTs. The car pictured here is about the farthest possible thing from a “base” model. This particular car was built specially for a Belgian Princess by Pinin Farina and has known ownership history from new. A restoration was completed in 1997 and it’s been on the show field at Pebble Beach. Somehow, RM’s catalog entry is completely devoid of any technical information on the car. Power is likely from a 3.0-liter V-12, and this is thought to be one of four Coupe Speciales bodied by Pinin Farina, though the coachwork is unique. It should sell for between $11,000,000-$13,000,000. Click here for more info and here for more from this sale. In 1953, Packard was acquired by Studebaker. It was a bid for survival for both marques that ultimately worked out better for Studebaker (but not by much). The last two years of Packard production were 1957 and 1958 and the cars they churned out in these model years were essentially just re-badged Studebakers. For 1957, the Packard model line consisted of a lone model: the Clipper. Two body styles were offered: a four-door sedan and a four-door wagon. Interestingly, the 1958 model year had twice the offerings. This six-passenger Country Sedan station wagon was one of just 869 examples built. It’s powered by a 4.7-liter V-8 rated at 275 horsepower. It was restored by a marque specialist and is finished in pretty lilac and white. Imported into Switzerland in 2010, this rare American wagon would be at home in any collection worldwide. It should bring between $55,000-$70,000. Click here for more info and here for more from this sale. Update: Sold, RM Sotheby’s Ft. Lauderdale 2019, $56,100. Mecum has become the go-to place for classic wagons and pickup trucks. This sale has some great examples of both, including this 1962 Corvair Wagon. The Corvair was new for 1960 and it was a revolutionary design with its rear-mounted, air-cooled engine. The platform saw cars, vans, and pickup trucks applied to it. 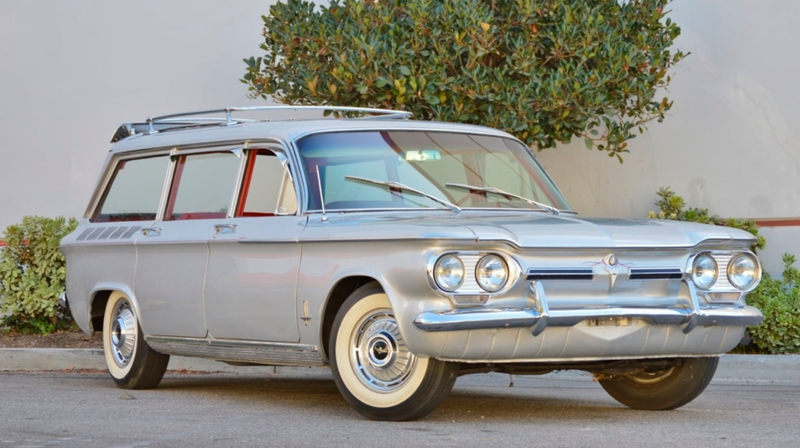 Station wagons were only available in 1961 and 1962, making this the last of the line for Corvair Wagons. In 1962, the wagon was available in two trims: the Lakewood (which was the Series 700 Corvair you see here) and in upmarket Monza trim. The Lakewood only made it through half of the 1962 model year as it was competing against the new Chevy II Wagon. This car is powered by a 2.4-liter flat-six that would’ve made 80 horsepower when new (though the catalog says it is a “high-output” engine, which may mean it has the 84 horsepower Monza engine). Only 3,716 Lakewoods were produced in 1962 and this one has 93,000 miles on it. Click here for more info. Dodge’s 1958 line included, in order of increasing luxury: the Coronet, the Royal, and the Custom Royal. 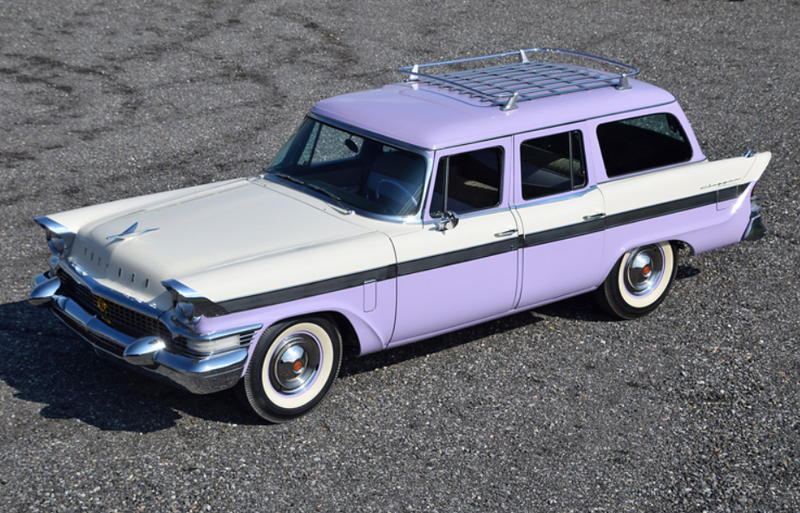 Their station wagon line was separate and the base wagon was the two-door Suburban – the only two-door wagon they offered in 1958. It’s powered by a 5.7-liter Ram Fire V-8 good for 295 horsepower. 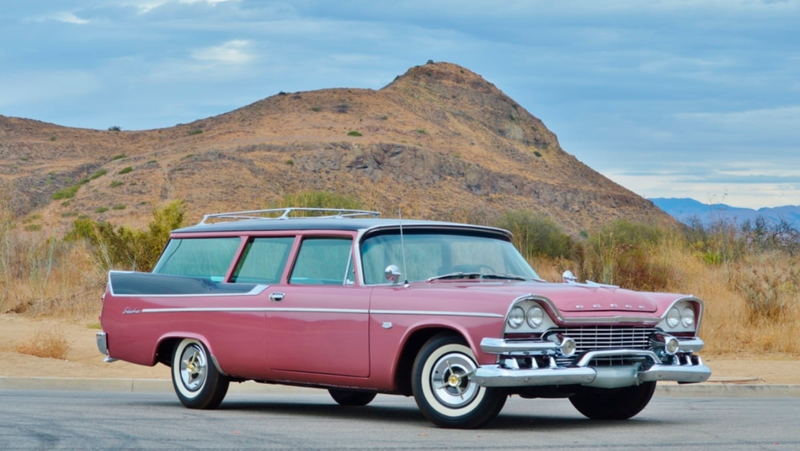 Dodge built about 20,000 wagons in total for 1958, split between this and four other models. This one has been restored and, even though it’s a two-door car, it seats a clown car-like nine passengers. The pink and black color scheme is great. It would be impossible to buy this and not load up your family and trek them to the Grand Canyon. Click here for more info. Ah, the ’57 Chevy. The Bel Air was the top Chevrolet for 1957 and 1957 was the final year of the second generation of this model. 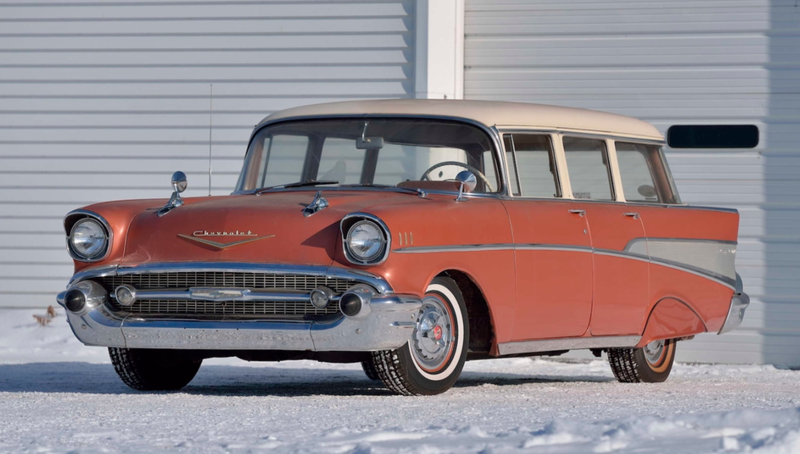 It is the epitome of 1950s American passenger cars and this wagon is a rare bird. The two-door wagon, the Nomad, is an expensive and sought-after car. But the four-door wagon, the Beauville, was much more common in its day, even if they seem rarer today. It’s powered by a 4.3-liter V-8 making 170 horsepower. When new this car cost $2,580 and only 27,375 examples were built making this the second-rarest 1957 Bel Air body style behind the Nomad. It’s a 64,000 mile car and it can be yours! Click here for more info and here for more from this sale. Update II: Sold, Motostalgia Amelia Island 2018, $19,800. Indy roadsters, as this style of race car is often called, are the coolest cars that ever raced at Indianapolis. These were driven by men who muscled them around the track, two hands on a steering wheel that looked like it came out of a bus. Frank Kurtis’ cars – when equipped with that Offy underhood – were unstoppable in the 500. After it’s brief history on the Championship circuit, it was used a supermodified car before being rescued by a major Indy roadster collector and restored to the condition you see here. It’s still powered by the legendary 4.2-liter Offenhauser straight-four. Only 14 Kurtis-Kraft 500Gs were built and they’re one of the best-looking of their type. This one should bring between $300,000-$375,000. Click here for more info and here for more from this sale. 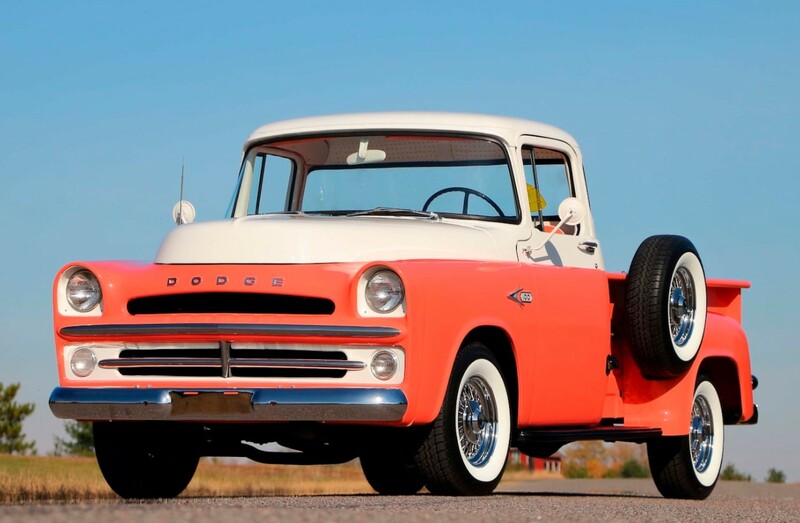 The 1957 Dodge pickups are great-looking trucks, especially the ultra-rare D100 Sweptside. As discussed in that post, the D100 was actually part of the C Series of pickups that Dodge offered between 1954 and 1960. The D100 was the 1/2 ton model. In 1957, the engine was either a six or eight and this truck has the 5.2-liter Red Ram V-8 making 204 horsepower. And it. Is. Clean. This is a great color scheme for a truck, very 1957. The 1950s offered some pretty pickups, and this is no exception. See more here. 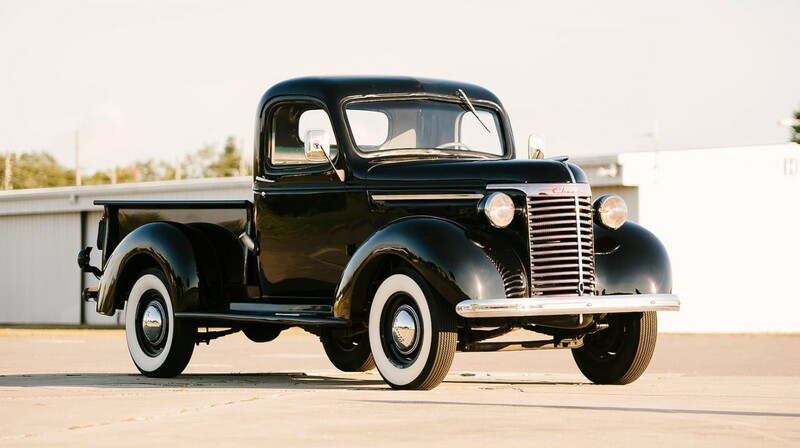 The Chevrolet Master was produced between 1933 and 1942. After the war their model names would change, but the pickup truck had been part of their lineup for some time prior to that. Their pickups from this era shared the same basic design as their passenger cars as they were all offered as part of the same model line. This truck is powered by Chevy’s 3.4-liter straight-six, likely producing 85 horsepower. The dark green shortbed example you see here was restored about 1,500 miles ago and it has a wooden bed. Click here for more info. Update: Not sold, high bid of $30,000. This truck is powered by a 3.3-liter straight-six. It’s well optioned and wonderfully restored. PT Plymouth pickups aren’t that easy to come by and they’re some of the prettiest trucks you can get. You can see more about this one here. 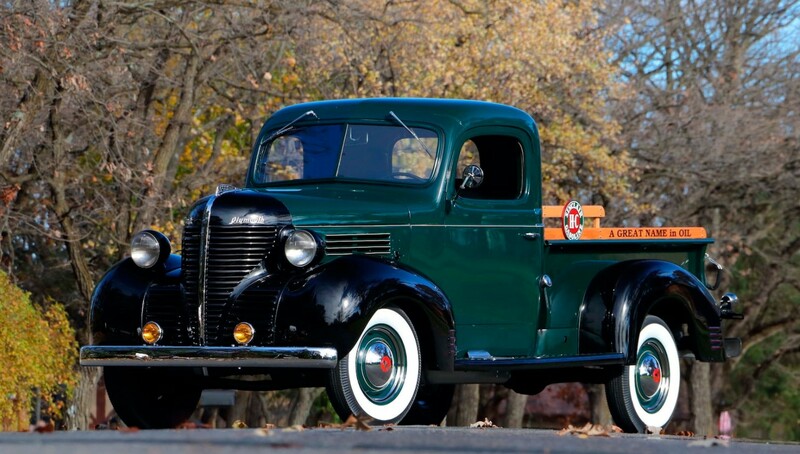 Mecum finds some great old pickups for their sales. The 1941 Ford was introduced, obviously, in 1941 and was the same model they picked up after the war ended, producing it through 1948. But, their 1941 Pickup used the leftover styling from 1940. So this truck was part of the newer line of cars (with a new-for-’41 color, Lockhaven Green), but still looks like an older one. The engine here is an 85 horsepower, 3.6-liter Flathead V-8. This example had a frame-off restoration that took it back to as-new condition… likely better-than-new. 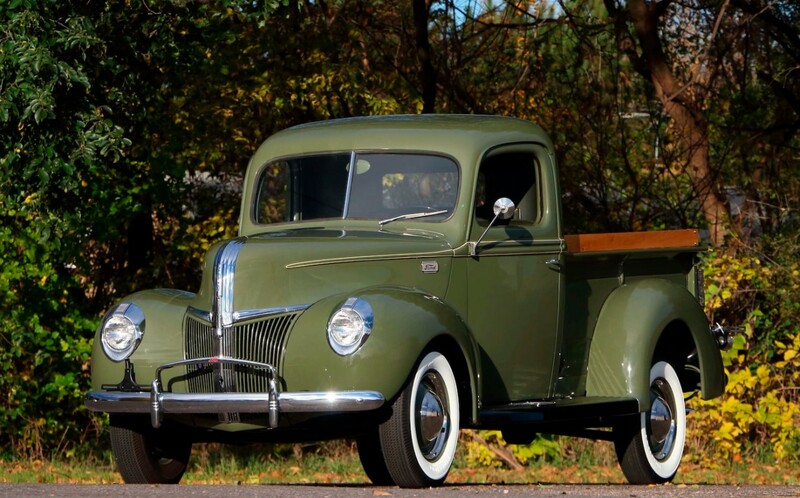 Ford pickups never go out of style, and this is a great one. Click here for more info. Update: Not sold, high bid of $32,000. 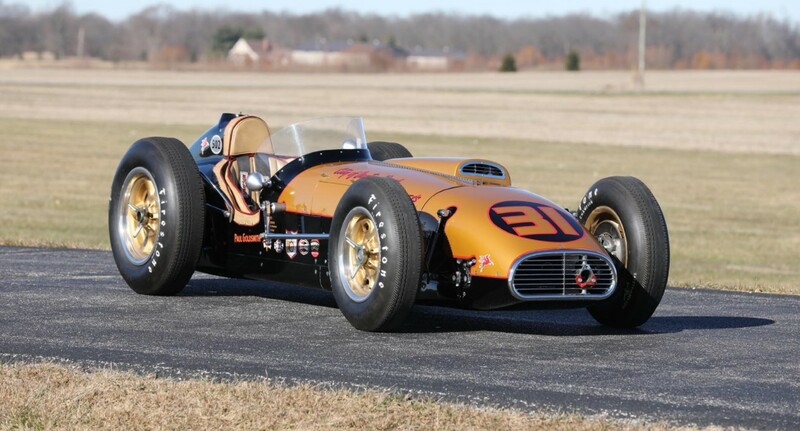 Update: Sold, Mecum Indy 2018, $37,400. Yes, even Mercury got in on the pickup game after WWII. The Mercury M-Series was offered between 1946 and 1968. Sold primarily in Canada, these trucks more or less mirrored Ford’s American offerings with slightly different exterior styling. This third generation truck is the Canadian equivalent of the Ford F100, meaning it’s the 1/2 ton model. Two engines were offered in 1959, a 3.7-liter straight-six or a 4.8-liter V-8, and this truck is equipped with the former. It’s a step-side pickup that presents well enough. 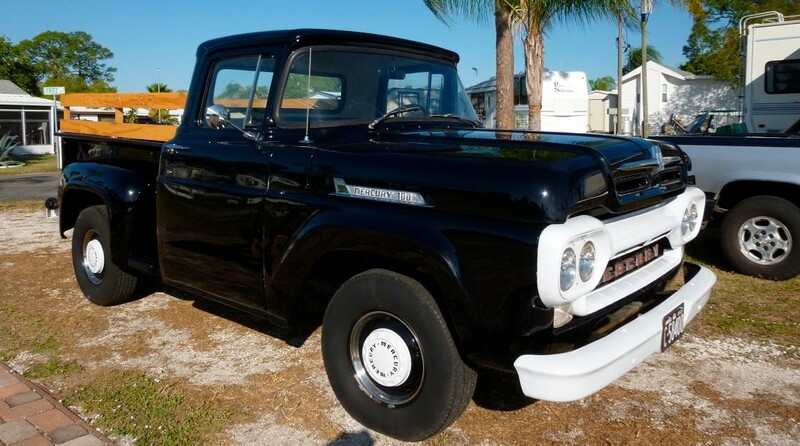 This is an interesting truck and a rarity in the U.S. Click here for more. Update: Not sold, high bid of $16,000. International Harvester, now a company that builds tractors and semis, used to build passenger vehicles. The final examples rolled off the line in 1980, and those were SUVs. 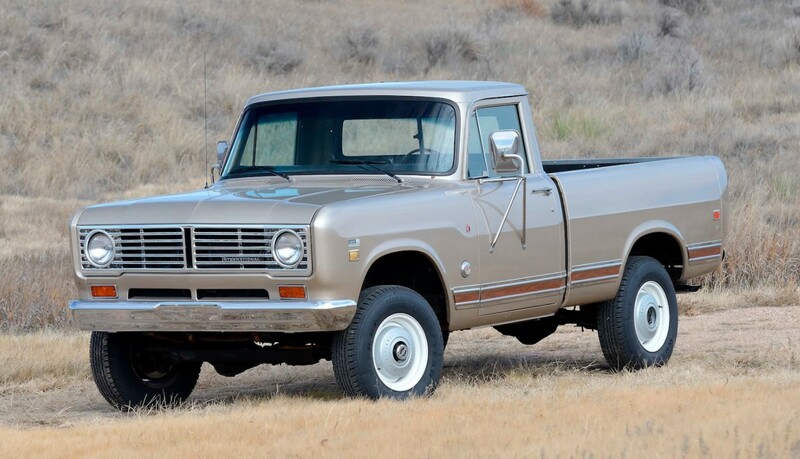 True pickup production ended in 1975 when they built their final example of the D-Series Light Line pickup rolled off the line. These trucks were built between 1969 and 1975. This Model 1210 was the 3/4 ton model and it’s powered by a 6.4-liter V-8. It’s got 4-wheel drive and this example appears to be a survivor. International-branded pickups don’t get the credit they deserve in collector circles as everyone wants a Ford, Chevy or Dodge. These were the workhorse trucks. IHC would be doing good business today if they had remained in the market, but instead you’ll have to settle for a time capsule like this one. Click here for more info. 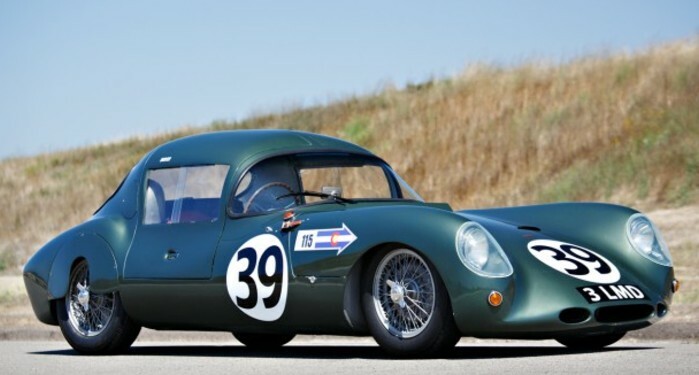 Three quick things we love about this car: 1. that shade of green; 2. the fact that it’s a factory race car from a cottage industry sports car manufacturer that has survived this long and; 3. gullwing doors! There aren’t many car companies out there founded by women, but Daphne Arnott managed to produce about 25 cars – some for the road, some for the track – between 1951 and 1957 in London. She started with F3 cars and ultimately ended up with Coventry Climax-powered sports cars that competed at Le Mans. This car uses a 1.1-liter Coventry Climax straight-four that makes 94 horsepower. After the ’57 24 Hours, the team (and automobile-building portion of the company) folded. This car was parked in the Arnott workshop for over 15 years before being rescued in the early 1980s. The new owner restored it and it’s had a few other caretakers since, successfully completing some touring rallies along the way. Being the only Arnott quite like it, of only a few automobiles produced in total, it should bring between $350,000-$425,000. Click here for more info and here for more from this sale. This is exciting. There are a few cars that we’ve never been able to feature on this site because, well, they just don’t trade hands often. Well now we get to cross one of the big ones off the list. A Jaguar XKSS hasn’t come up for public auction in quite a while. Last time one did, the market was markedly different. The XKSS was Jaguar’s road-going variant of the legendary D-Type race car. What’s weird though, is that Jaguar built less road cars than racing cars. That’s because in 1956 Jaguar walked away from motorsport and still had 25 D-Types that they had yet to sell. So Sir William Lyons, the head of Jaguar during its golden years, realized he could make some serious money off of American buyers who were lusting after European sports cars. 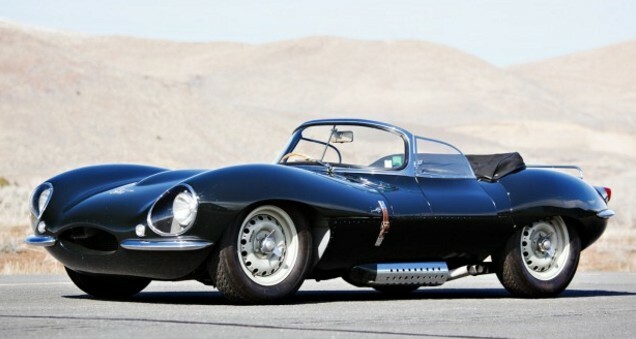 With an as-new price of $6,900, Jaguar launched the roadster-only XKSS and planned to built 25 of them. But a fire broke out at the factory after only 16 had been completed. and that was it… until 2016 when Jaguar announced they would build, from scratch, the nine remaining cars to finally complete the 25 car run. While they will be exacting in their construction, the newer cars will never have the same appeal as the originals. This car features the correct 3.4-liter straight-six making 250 horsepower. Top speed is listed at 149 mph, with 60 arriving in 5.2 seconds – a time that is still respectable today. Of the 16 built, 12 were sold new in the U.S. and some of them, this car included, saw track time in their day. It has known ownership history from new and has been in the possession of the consignor since 2000. The restoration is glorious. It could be another decade before another XKSS comes up for sale, as most of them are locked away in long term collections. It’s a legendary road car – and one of the rarest and most sought after cars of any marque. It certainly tops the list of nearly every Jaguar collector as the must-have Jag. Gooding and Company isn’t shy about what they think it will bring, slapping an estimate of $16,000,000-$18,000,000 on it. Click here for more info and here for more from this sale. Update: Not sold, high bid of $11,900,000. Giovanni Agusta founded Meccanica Verghera Agusta, later changed to MV Agusta, in 1945 to build motorcycles. Agusta was an aviation company that dates back to the early 1920s, but motorcycles didn’t come until after WWII. MV Agusta has had a number of corporate overloads, but currently operates mostly independently (they are 25% owned by Mercedes-AMG). What most people don’t know is that this bike manufacturer built a small run of light commercial vehicles in the 1950s. 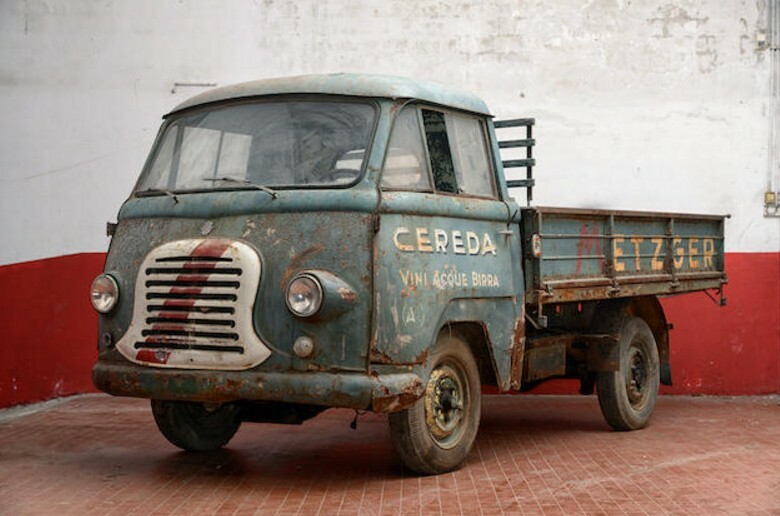 The Autocarro was a light delivery truck and MV Agusta sold their first example in 1954 (though it was a three-wheeled, motorcycle-based trucklet at that point). Production stopped in the early 1960s. This 1100 D2 is powered by a 27 horsepower, 1.1-liter twin-cylinder diesel. It is presented in barn find condition, but it is very interesting. Very few of these were built and even fewer survive. It is thought that D2 production totaled about 2,000 units – a fraction of what Fiat was turning out at the same time. This project deserves restoration and should bring between $32,000-$43,000, even in this condition. Click here for more info and here for more from Bonhams. 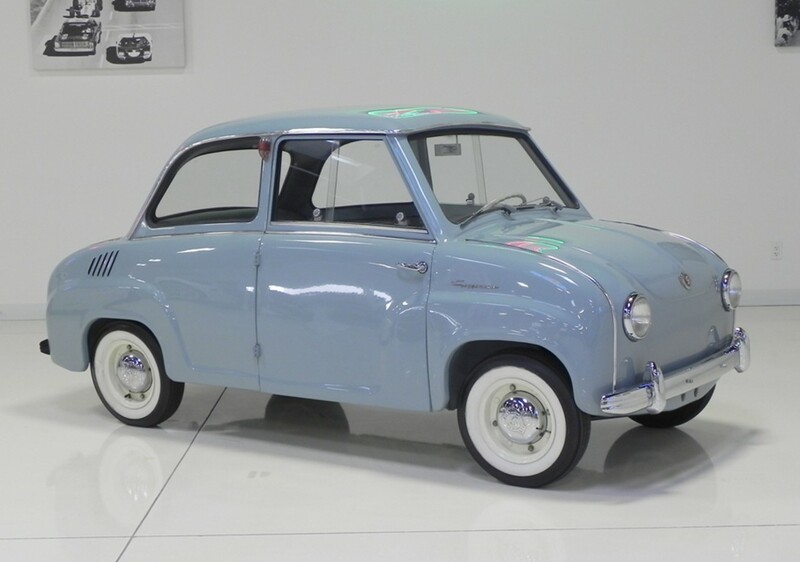 Goggomobil was a German marque produced by Hans Glas GmbH between 1955 and 1969. 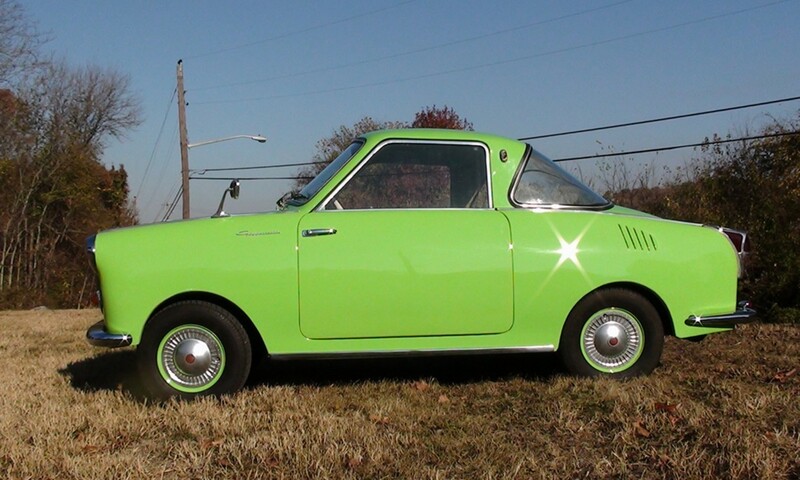 They were microcars offered in a few different body styles. The Sedan was the “T” and the T-250 was the first model offered, going on sale for 1955. The engine is a rear-mounted 247cc straight-two, two-stroke engine that makes about 13 horsepower. It’s a four-seater with rear-wheel drive. Two other, more powerful, sedans were later offered and the sedan stayed in production through 1969. Goggomobil sedans aren’t seen often, but they aren’t particularly rare with over 210,000 examples produced in 14 years of production. This one is flawless. Click here for more info. The TS was Goggomobil’s Coupe. Three different models were offered over the lifespan of the model, with the TS300 being in the middle, power-wise. The car was introduced in 1957 and was more expensive than the sedan counterpart. This car was sold in France as the Glas Isard. More expensive than the sedan, the coupes are much rarer, with only 66,511 having been built. The TS300 is powered by a 293cc straight-twin making almost 15 horsepower. Top speed was between 53 and 59 mph (depending on wind and road grade, perhaps?) and this one is street legal in the U.S. It’s in good shape and you can see more about it here and more from Barrett-Jackson here.